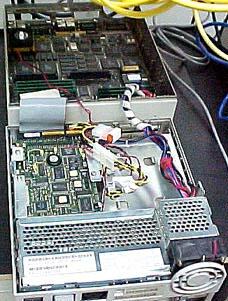 Obsolyte.com is hosted on a Sparc IPC, running RedHat Linux 6.0 for Sparc (UltraLinux) and the Apache Web Server. This particular machine has 32 Megs of Ram and a 500 Meg HD. BogoMips = 24.88, which makes it about as fast as a 486/50 PC. Truely obsolete and yet, very cool! 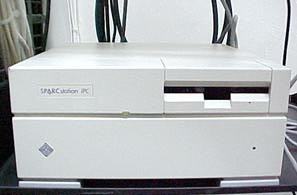 This Sparc IPC also has a few modifications that I added (such as the drive LED hack in the center of the front of the case). The LED Hack was created by just trimming a bit of plastic from the top half of the case (where the drive bay is), and placing an LED there with a drop of glue. Getting the wires to the LED jumpers of the drive was the toughest part, as the drive bay has little room for such amenities! The other hack to the IPC is the chip fan. Since I'd be running this machine all the time in a hot machine room and have an internal HD, I wanted to get the maximum airflow. Removing the floppy drive was the first step, as I didn't need it and it was otherwise taking up room and generating heat. 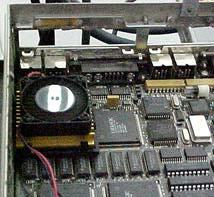 Then I placed a chip fan and heatsink from a PC (a 486), and sandwiched the whole affair onto the Weitek FPU, on the rear left of the motherboard. The Weitek is smaller than a 486, but the proximity of the plastic side of the case allowed me to wedge the heatsink's plastic bracket properly into place. If this hack actually helps to cool the machine or not is debatable, but in my opinion, any kind of airflow is a good thing. SIMMs. Onboard mono frame buffer. 1.44M 3.5"
Here's a shot of the whole affair opened, so you can see how the pieces all fit together. The drive bay(s) and power supply are the top half of the case, while the motherboard and any cards it might have are in the lower half of the case. What's this still good for? I get asked that question more than you might think. Well, like I said, it's equivalent in raw CPU speed to a 486 at 50Mhz. However, total throughput is actually a bit higher - because for one thing, the CPU is really optimized to run UNIX, while an Intel processor isn't. Next, this little box has SCSI, while most pc's have IDE, and SCSI is quite a bit faster. Plus, everything, including the enternet, is all integrated into the main board, so there's no "bus" problems (most 486's are ISA bus). So, actual overall performance is actually a little bit better than a 486 at 50Mhz. Not that this is going to go head to head with a Pentium III, but for acting as DNS, or light web hosting, or a small mail server, this is a fine box. Don't try and make it do everything, as many services eat RAM, and a high load will slow the thing down to a crawl. However, for a single use, lightweight server, this will provide many years of trouble free service. And, it doesn't take up much space.